Cold Aisle Containment takes the Hot Aisle Cold Aisle strategy and adds a containment component to the cold aisle. This design minimizes the mixing of hot and cold air to increase the effectiveness of the CRAC units. This strategy is particularly effective and efficient when blanking panels are used and when loads are greater than 6kw per enclosure. In row cooling with hot aisle containment brings the cooling closer to the load while at the same time contains the hot aisle. This strategy drives cooling efficiencies by bringing cooling units closer to the load and is very effective at per cabinet loads of 6kw and above. Careful planning and design needs to be taken to ensure an efficient and robust in row cooling with hot aisle containment system. . In a strategy employing overhead supplemental cooling, supplemental cooling units are placed above the enclosures. This drives cooling efficiency by bringing cooling units closer to the load and uses the principle that cold air falls and hot air rises. While this design strategy is very effective at enclosure loads of 6kw and above it often requires cabinet and/or room modifications to support the required cooling medium and extra plumbing. A ducted return strategy places solid doors placed on enclosures and a chimney is added to the top to duct out the hot air back to the CRAC. This minimizes mixing intake and exhaust air and shortens the return path for exhaust air back to CRAC. 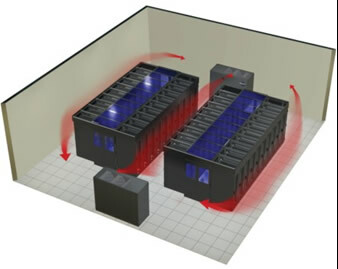 While inexpensive to implement this strategy begins to fail at enclosure loads above 3kw and the increased pressures can negatively impact server fan performance. Our Opengate active chimney solution is very innovative. Chimney/Ducted Air Separation has proven very effective. Our partners patented Opengate’s design (their fan system is pressure activated) creates a zero pressure environment, matching CRAC, Server and Return CFM to optimize Cooling efficiency and effectiveness. It is widely known that air-flow distribution management is one of the best opportunities for cooling efficiency gains. Basic Air-Flow Solution = Utilizing networked temperature sensors, our controller ties into existing CRAC’s (preferably with VFD technology) and modulates air delivery based on real time temperature feedback to improve efficienc y. This is accomplished by matching delivered air with cooling requirements in a more ‘Zonal’ approach. Advanced Air-Flow Mgt. Solution = Room Scale Intelligent Cooling (RSIC) – A similar concept to the above but a much more precise/ micro approach to optimization. Using CFD data on the front end, networked floor tile based Air-Movers, temperature sensors and return Air-Movers are deployed to optimize air delivery, minimize air mixing and effectively remove hot air. The key is the precision/micro delivery of cold air where it needs to be (rack/row level) precisely when it needs to be there. The same is true for heat extraction. Typically 20-30% of the current CRAC/CRAH capacity can be idled for hot standby. The result of a successful RSIC deployment is a fully optimized, maximum efficiency cooling environment. Efficiency gains average 20-30% and results of 52% have been experienced. The solution includes very robust alarming, notification, tracking and trending capabilities and can include a very advanced thermal monitoring service. ECS now carries a wide range of both standard and custom containment solutions. We believe in a consultative approach when recommending containment products and partner with industry leaders including Liebert, Eaton, APC and AST. Please contact us for additional information or a site survey. Lower data center energy demands and save on energy costs. Container Based Data Centers are quite literally a data center in a box. 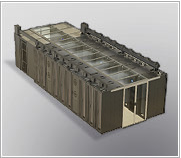 Typically configured in a 20 or 40 foot steel container these data centers contain the cooling and equipment enclosures within, so cooling is only provided to the equipment. This solution is great for high density applications as it can allow for up to 40kw per enclosure. 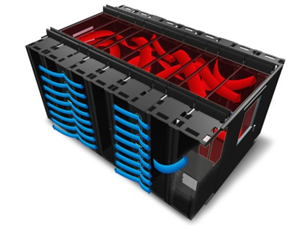 A container based data center can also be a good option for expanding an existing data center that is out of traditional cooling capacity and/or space. 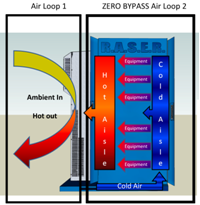 Micro Container Based Data Centers takes advantage of their zero by-pass, closed loop on board cooling to provide efficient cooling directly to the enclosure. Both the hot and cold aisles are contained at the enclosure level and this solution does not require raised floor or existing CRAC/CRAH to deploy. 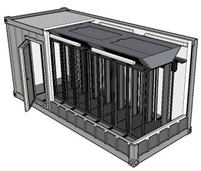 The Micro Container Based Data Center supports loads from 12kw (air cooled) to 16.5kw (water cooled). Remove the pain of dealing with overheating network switches. Get cool air delivered directly to network switches, firewalls, routers and such devices mounted in the top of cabinets. Gain piece of mind for you or your colocation customers and eliminate the worry of overheating. Available in either passive or active modes, and in a range of configurations from 1U to 9U. Airflow can be through the front, side or rear depending upon device requirements. With active switch cooling, network switches, load balancers, and routers are often mounted in the back of the cabinet for more convenient cabling connections. Unfortunately, these switches installed at the back of the rack can be critically damaged when they are cooled with pre-heated air from the servers. With passive Switch Cooling, Geist's Opengate Passive Switch Cooling guides cool air to network switches mounted in the rack without fans. The economical solution is ideal for low density environments where heat intensity is modest but still remains a threat. Intelligent heat removal and monitoring solution for servers, network switches and phone systems in small spaces. The Opengate RAC10 system evacuates heat load from closets and small rooms and sends it to the outside corridor or ceiling plenum return. The RAC10 maintains a perfectly controlled environment in small computer and network rooms using building air while providing the needed visibility to cooling capacity and environment information and alarms. Email alerts and the web interface provides remote alarms and management for superior visibility and control of room environment. The Opengate RAC10 system can be mounted to the wall or the ceiling mount for automated heat exhaust and critical monitoring/alerts. Effective room airflow control and monitoring solution for servers, network switches and phone systems in small spaces. The RAC10 system evacuates heat load from the small space and sends it to the outside corridor or ceiling plenum return. Maintain a perfectly controlled environment for your small computer and network rooms using building air while providing the needed visibility to cooling capacity and environment information and alarms. Email alerts and the web interface provides remote alarms and management for superior visibility and control of the room environment. Continually deliver cool air to your IT equipment. Real-time plus historical cooling capacity and environment monitoring. Early alarm notification to email account’s through a secure Ethernet connection. Allow multiple email or SNMP trap recipients with escalation. Email and/or communicate with existing management software. To install the RAC10 in a drop ceiling, 18 gauge hanger wire must be used to support the unit. Attach the hanger wires to the four eyelets on the backside of the RAC10. Place the RAC10 across the ceiling grid using the hanger wire to support the weight. Plug the RAC10 into the power receptacle which is required to be out of the ceiling plenum. Option Duct Kit can be ordered if required. The dimensions of the RAC10 fan enclosure is 14 1/4” x 21 1/4”. The RAC10 fits between the standard 16” center studs. Mounting as close the ceiling will maximize the heat exhausted. Use 2”, #10 wood screws to attach the unit to the wood studs. A power receptacle is required within close proximity to the RAC10. Contact us today and let us help you and your datacenter keep your cool. If you have questions or have special considerations, we invite you to contact us. Click the link below or give us a call at (800) 570-5755. We're here to help. Copyright © . Enterprise Control Systems. All Rights Reserved.